Shaped like a long, willowy “Y” in the north of Lombardy, Lake Como is ringed by colorful fishing towns and magnificent villas. Surrounded by the foothills of the Alps, the lake has been a playground for the wealthy since the time of dukes and kings and it’s easy to see why. The lake has all the beauty and benefits of the outdoors with all the comforts of high-class Italy. There’s no lack of cafés, bars and fancy restaurants to frequent along the lake not to mention sublime views and plenty of shopping! Even today the area is still ritzy enough to sparkle like the lake’s water, only now it’s open to all. Spring is by far the best time to visit the lake. The area begins to awaken from its slow-season hibernation just as the flowers start to bloom. In fact, those flowers are a huge part of Lake Como’s beauty! The lake’s unique microclimate helps to grow magnificent gardens and the aristocrats and celebrities who live there help cultivate them. That combined with its charming villages and unique geography making it one of the most beautiful lakes in the world. Of course Lake Como is known for its namesake town, but there’s so much more to explore beyond Como. Though many visitors take a quick day trip from Milan up to the lake, we suggest giving yourself at least a night or two to drink, shop, eat, and explore all the lake has to offer! Here it’s all about enjoying beauty for beauty’s sake. Whether you’re strolling the promenade, eyeing the expansive mountains from the water or surrounded by the lush gardens of the elegant villas, beauty is the theme. These are some of our favorite beautiful towns along the lake and the most beautiful gardens, villas and sights to see in each one. Known as the pearl of Lake Como, Bellagio sits like a tiny pearl on the tip of a peninsula separating the two branches of the lakes. A resort town since the ancient Romans, Bellagio is still one of the most popular towns on the lake today and can easily be packed during summertime. Come around 5 pm when visitors are starting to trickle away. Walk the steep stony streets and narrow alleyways and browse the artisan shops and jewelers. After, choose the best table you can find along the water and get a spritz for a nice lakefront aperitivo or drink with snacks. You’re on vacation so allow yourself to lounge like the ancient Romans once did! The lake’s namesake town, Como is one of the few towns with something to see beyond a villa or beautiful view (though it has those also). The ritzy town lends itself to fine dining and fancy boat rides, but stroll the streets to get to know it a bit. Como was the birthplace of ancient Roman poets Pliny the Elder and Pliny the Younger as well as Alessandro Volta, the inventor of the battery, who has a museum dedicated to him there. 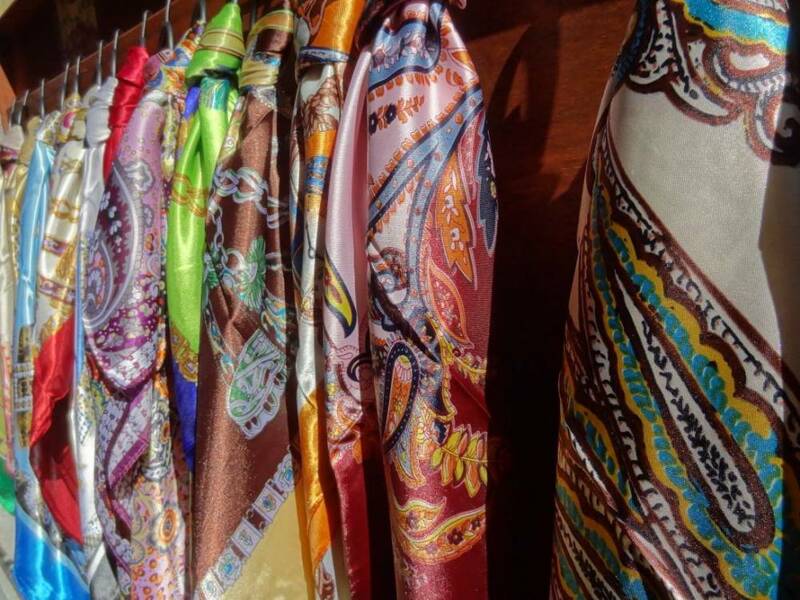 Make a visit to the Cathedral of Santa Maria Assunta with its magnificent Gothic façade and even if you don’t have the time to visit the silk museum you might just find the time to shop for a silk scarf or tie! All the area is famous for its silk weaving industries. After, you can take the funicular from the center of Como to Brunate, a small village on the mountain above Como, for spectacular views. Just north of Como, Lenno is a sleepy town filled with beauty. Though it’s a perfect escape from the crowds, it’s also home to the sumptuous Villa del Balbianello, a yellow villa on the south of town that juts out into Como’s waters. The Villa is famous (as always) for its gardens but especially for being the setting of the Star War’s Episode II Attack of the Clones. Beyond that, Lenno also has a charming town square and one of our favorite lakefront promenades, tucked in a tiny inlet on the lake. A veritable resort town, Menaggio is a popular base on the western side of the lake for international and Italian tourists. Just 8 miles from Lugano, Switzerland – a favorite for its shopping – it’s also well connected to the rest of the lake. Menaggio offers more in amenities and entertainment than other Lake Como towns including restaurants, hotels, a youth hostel, live entertainment and even a mini-golf course. 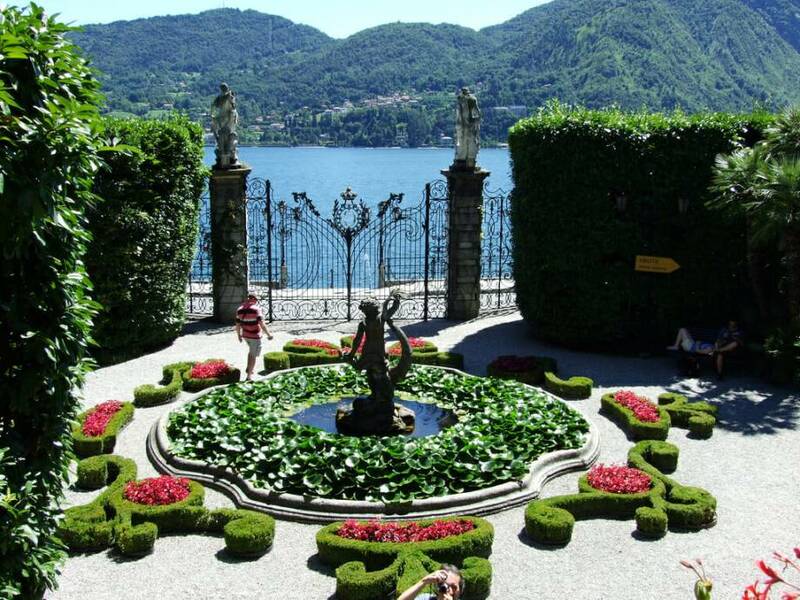 Visit Tremezzo to see Villa Carlotta, a 17th-century mansion-turned-museum, and its impressive Italian garden. It’s one of the most beautiful gardens in all of Italy! The garden covers nearly 20 acres of land in color with azaleas, camellias, hydrangeas, ferns and citrus trees. Different paths lead you to different parts of the garden depending on how much time you have. The town itself is essentially squashed against the lake in a long line of houses, but there is an area off a public park with steps into the water where you can swim. There it is clean but quite deep. Children will want to access the water near the shallow pebble beach nearby. On the eastern side of the lake’s two branches (or legs, as some see it) sits Lecco. Famous as the setting of The Betrothed, a historical Italian novel by Italy’s esteemed author Alessandro Manzoni, today it’s an industrial town and one of the biggest on this side of the lake. Its city center is nevertheless clean, well-organized and filled with life. It’s a perfect place to stretch your legs, get a focaccia or ice cream then grab a seat along the lake and enjoy the via vai of people and boats and swans that pass the harbor. Founded in 769 by fishermen, today Varenna is a vibrant town popular for its pathway lungolago. The waterfront path is as long as the entire village and makes for a lovely stroll day or night. Restaurants, artisan shops and ice cream shops dot the pathway. Continue your stroll through the town and on to the Villa Monastero, most impressive for its gardens stretching out along two kilometers of prime lakefront real estate. The garden is decorated with sculptures, reliefs, fountains and a small Doric temple but all pale in comparison to the palm trees, agave plants, cacti and succulents and entire walls of roses that fill the historical garden. Far less visited than Varenna, Bellano is just as charming and likely to be more budget friendly. Here you could actually imagine getting a room with a lakefront view. A quiet escape, there’s also a natural, plunging ravine called Orrido di Torrente Pioverna. Roughly 15-million years old, it’s well worth a walk along its steel pathways. Como is easy to get to from Bergamo or Milan airports. The Lake is large, so driving times will vary by town, but Milan to Como by car takes roughly an hour as does Milan to Lecco. If you are self-driving, you’ll exit the highway and follow the Strada Statale 340 for the western shore or the SS 36 for the eastern shore, but your best bet is to get a car with a navigator. Trains go from Milan to Como on the western shore and Lecco, Abbadia Lariana, Varenna, Colico and a few others on the eastern shore. Check the TrenItalia website for timetables, prices and destinations available. You can see Lake Como by car, boat or public ferry. If you take private car service or rent a car to explore the area, you’ll join a long parade of Ferrari’s, Lambourghini’s and Porche’s zipping around the winding lake roads. You can stop wherever you want and have no time restrictions, but parking can be problematic and most towns are pedestrian-only zones. If you’d like to stick to public transportation you can catch a bus to most towns along the lake. Otherwise, you can tour around by water. The public ferries are run by Navigazione Lago di Como. The ferry and car service only runs between the most popular of Lake Como’s towns: Menaggio, Bellagio, Varenna and Cadenabbia (Tremezzo) but you can take private boat service to nearly all of the towns along the lake. 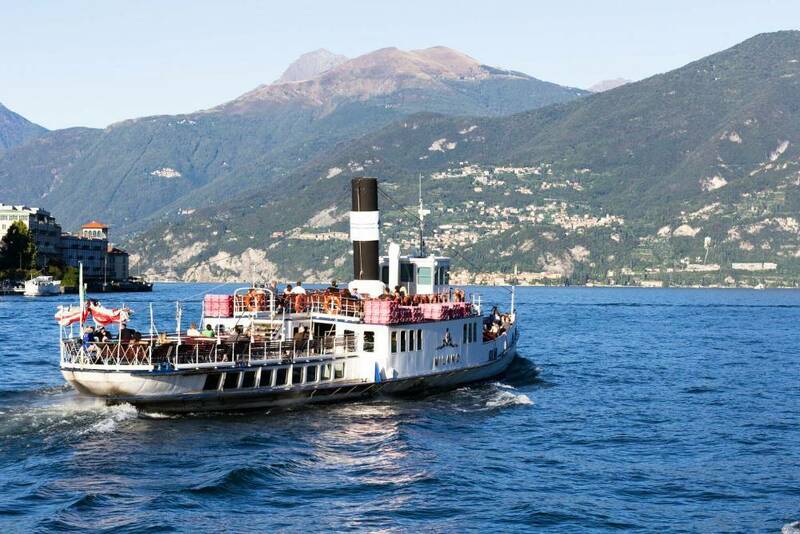 The only option if you want to crisscross the lake, it’s also by far the most scenic way to travel Lake Como. All those fancy villas? They were built to be seen from the water! Ready to visit Lake Como? 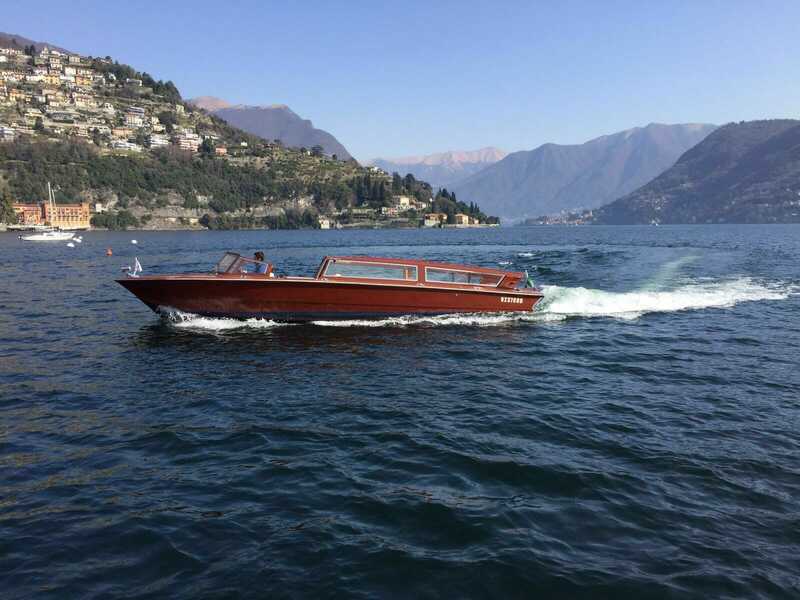 Indulge yourself with a private boat tour exploring some of our favorite Lake Como sights. After the luxury of Lake Como you’ll enjoy the lush countryside among Piedmont’s vineyards and relax in the idyllic Italian Riviera on our Northern Italy Indulgence trip!